The Flavia cabriolet will be Lancia's first four-seat convertible since 1967. FRANKFURT -- Lancia unveiled a production version of its mid-sized Flavia Cabrio at the auto show here. The model is a rebadged Chrysler 200 cabriolet and Lancia will start selling the convertible next spring. The Flavia Cabrio is powered by a 175-hp 2.4-liter gasoline engine coupled with a six-speed automatic transmission. Lancia has not offered a four-seat convertible since 1967, when it ceased production of the Flavia convertible, which was actually a 2+2 model. Lancia say the new model has been built to ''reclaim Lancia's territory in the luxury market." Talking to reporters at the show, Lancia-Chrysler CEO Saad Chehab said: "The reaction and public excitement for the Lancia Flavio Cabrio at the Geneva auto show could not be ignored and it led us to green-light it." Lancia displayed both the Chrysler 200 sedan and convertible at the Geneva auto show in March, hinting that each would be sold in Europe badged as Lancia Flavia models. The company now says only the convertible will come to Europe. Insiders say the cost of adding a diesel engine killed the business case for the Flavia sedan in Europe. Diesels account for about half of European passenger-vehicle sales. 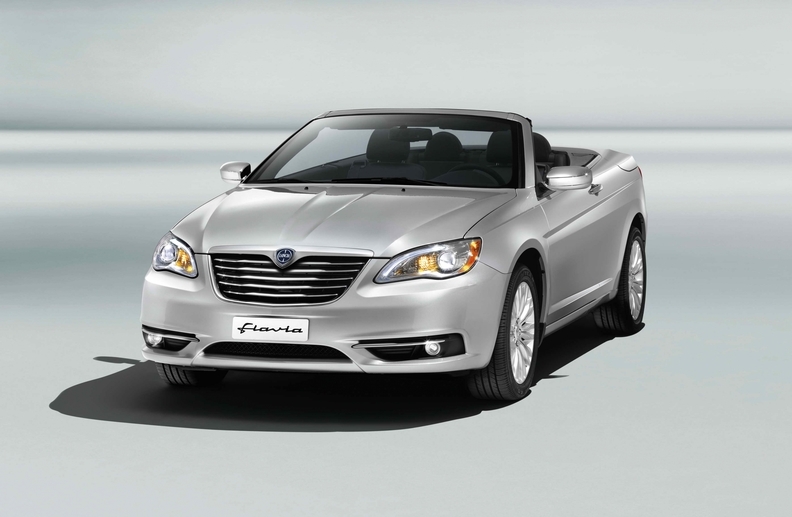 Executives at Lancia parent Fiat decided to stick with the plan to offer the convertible Flavia early next year. They're betting the cabriolet variant is attractive enough to withstand the lack of a diesel variant. Lancia will start sales of two other rebadged Chrysler models in Europe next month: the Lancia Thema, which is set to become the brand's flagship and the Lancia Voyager. The Thema is based on the Chrysler 300 large sedan will be offered with two engines, a 286-hp 3.6-liter V-6 Chrysler Pentastar gasoline engine coupled with an eight-speed automatic transmission, and a 190-hp and 239-hp 3.0-liter V-6 diesel built by VM Motori of Italy. Lancia is hoping to get a foothold in the German-dominated luxury segment with the Thema. "This new Thema has been built to reclaim Lancia's territory in the luxury market," Chehab said. The Voyager, a rebadged Chrysler Town & Country large minivan, will be sold in Europe with VM Motori's 163-hp 2.8-liter four-cylinder diesel engine and Pentastar 287-hp V-6 gasoline unit. Both are coupled with a six-speed automatic transmission.